Native Instruments' FM8 is a perennial synth favourite. Frequency modulation (FM) synthesis is often viewed as complex, but it's a powerful tool for creating twisted bass sounds. Think of regular vibrato, where an LFO - the modulator - modulates the pitch of an oscillator - the carrier. Now imagine that LFO's rate speeding upto the audible frequency range. This fast modulation introduces additional frequency content to the original tone. By applying modulation over time via envelopes and LFOs, we can introduce complex harmonic movement into a static synth tone. These modulations can be pushed into saturation and distortion stages - either within the synth itself or external plugins - to create gnarly, rasping basses. 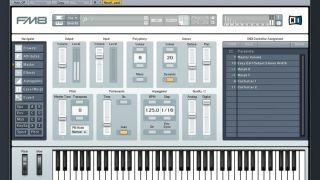 For more on synthesising bass sounds in software, check out the October 2014 edition of Future Music (283). Step 1: We've loaded an initialised FM8 on a new MIDI track and programmed two simple notes in over two bars - the second with a rising pitch bend. A sidechain plugin ducks the raw sine wave tone on each beat. Step 2: In the Expert tab's FM Matrix, we introduce operator E's modulation over operator F using an envelope with a slow attack. Osc E's waveform is changed to Soft Square, and a Ratio of 2 thickens out the extra harmonic movement in the patch. Step 3: Over in the Master section, we set the number of unison voices to 8. Detuning and panning them gives our patch aggressive width and power. Cranking up the Analog and Digital sliders introduces a harsh screaming fuzz over the bass tone. Step 4: Back in the FM Matrix, we use a triangle wave - Operator D - to modulate Operator E. We set its envelope to a short loop, which acts as an LFO of sorts, giving our aggressive modulation an extra rhythmic quality. Step 5: We route our main operator (F) to X, then a saturator module for a touch of bite. This is driven hard, and white noise is also mixed in for fizz. Operators F and X are both routed to the main output in parallel and blended together, adding grit. Step 6: For solid weight, we high-pass filter the synth and layer a sub tone underneath from a second FM8. iZotope's Ozone 5 then adds subtle width and grit to the original patch via its multiband compressor, harmonic exciter and stereo imaging modules.